The worst-kept secret in Canadian football doesn't need to be kept any more, as the Ottawa expansion franchise set to start play in 2014 officially announced that they'd chosen "RedBlacks" (and "Rouge et Noir" in French) as their name at an unveiling ceremony Saturday. RedBlacks had been the leading candidate for the new team's name since at least January, and it was reportedly firmly chosen in April, so there wasn't a lot of suspense here. The various logo leaks (including that of the final logo the team chose, which appeared online at the end of May) meant that part wasn't particularly suspenseful either. However, the Ottawa ownership group was still able to put on an impressive event, and they received strong support from the fans in attendance. They also showed they're cognizant of the importance of recognizing the history of Canadian football in Ottawa, and that's going to be crucial to this franchise's success over the long run. The ceremony included cheerleaders, a marching band, minor football players and a large amount of Ottawa CFL alumni, all of whom were brought up on stage along with CFL commissioner Mark Cohon, Ottawa GM Marcel Desjardins and ownership group members. All of that was received well by a strong crowd in attendance, and that led Ottawa mayor Jim Watson to say "This is an amazing sight" during his speech. Watson went on to talk about the importance of this team to his city, mentioning how it's a crucial part of the overall resurgence of Canadian football in Ottawa at the minor, CIS and professional levels. "We're seeing a renaissance in football," he said. "The Ravens are coming back to university football this fall. The Gee-Gees have a new field they start play on this fall. And the icing on the cake, CFL football comes back to Ottawa in 2014!" The ownership group's Jeff Hunt then took central stage with Desjardins to unveil the name and logo, doing so with a video (which can be seen here) that looked back at Ottawa's football history. "It's a story that goes back to Ottawa's founding as a lumber town and a story that's painted by the colours of Ottawa's sports history," he said. Hunt cited how the original Rough Riders wore red and black in tribute to the colours of Teddy Roosevelt's famed Rough Riders and the Canadians who fought with them, and he mentioned how red and black have become crucial colours for most of Ottawa's sports teams. "Our name and logo honour our past," he said. "We are Red Blacks." Gabriel mentioned the link between the RedBlacks name and rugby, which of course played a pivotal role in the founding of Canadian football, and he discussed how thrilled he is to see Ottawa back in the CFL. Jackson said he can't wait for an Ottawa flag to be displayed at CFL functions again. "I really get discouraged when I look and I see eight CFL flags up there and the CFL flag itself, and no Ottawa flag up there," he said. "It will be back next year. The over 100 years of history of Ottawa football has been locked away in a vault, but it will be back!" Gabriel then capped off the ceremony with a fervent statement, showing that it's not just the team embracing their past: the former players are embracing the new team as well. 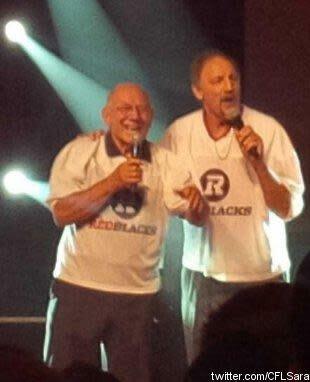 "Once a RedBlack, you never go back!"